Hey everybody! Just wanted to share a new layout that went up in the Garden over at Two Peas In A Bucket today. 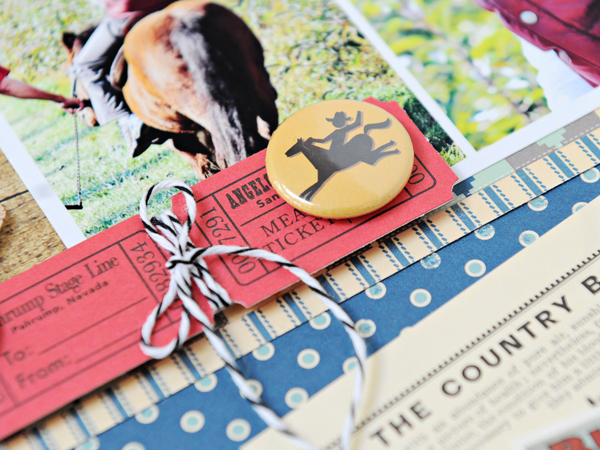 I was thrilled when the Sasparilla collection from October Afternoon finally made its way to the shop at Two Peas. 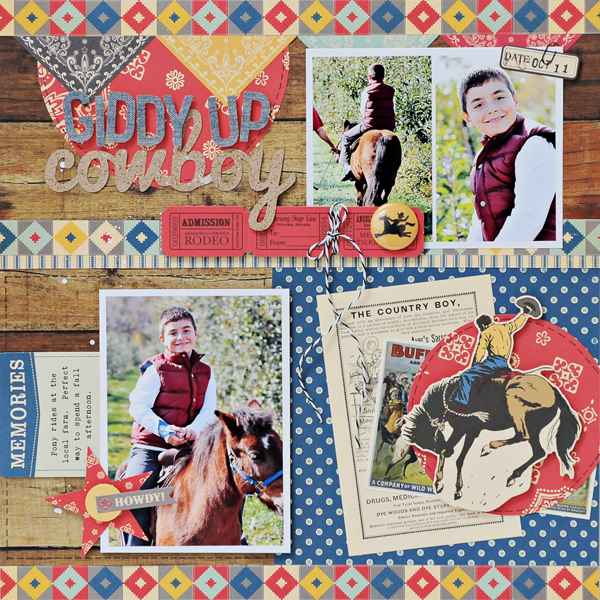 I have been waiting for that collection specifically so I could scrap these photos of my oldest son Darian riding a pony (whose name was Fudge) at the local farm last fall. This collection has such great deeply saturated colors in it that I just love! I kept my design pretty basic with a focal photo and two supporting photos. 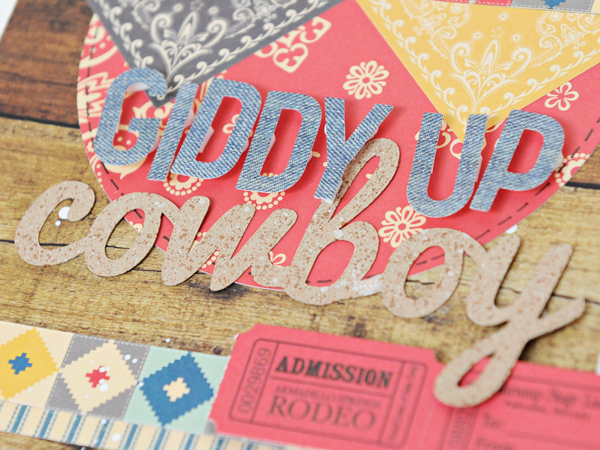 I layered several die cuts from the Miscellany package opposite of my focal photo and used both letter stickers from this collection and my a die cut "cowboy" using my Silhouette for my title. 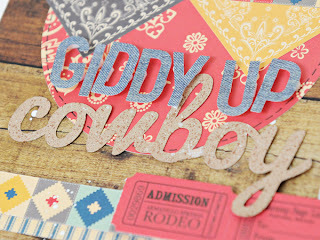 After I die cut the "cowboy" from kraft cardstock I spritzed it with a bit of Mister Huey to give it a more distressed feel. 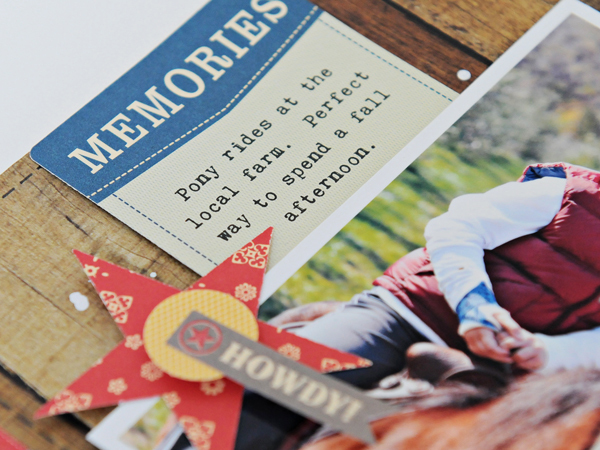 Adding embellishments to this layout was so easy since there were so many adorable ones to choose from. I think the hardest part was deciding what NOT to use. 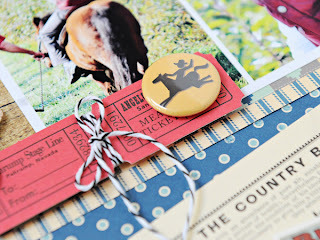 The cowboy tin pin had me at hello and I just couldn't resist adding it to the strip of tickets from the Miscellany package along with some baker's twine.